[00:00:28] <skunkworks> Those are just a tad better than the dapper install on this box. [00:21:44] <skunkworks> ok - what you have made before. [00:21:58] <skunkworks> the everything? gear box and all? [00:28:50] <skunkworks> park the crossslide in a stratigic location? [00:47:58] <Ito-Brazil> Is EMC2 USB compatable? I mean, using USB stepper drivers ? [00:48:46] <Ito-Brazil> can you say Why ? [00:54:14] <Ito-Brazil> LPT for servo ? [00:54:46] <Ito-Brazil> hey! What about ETH1 ? Can I make a Ethernet compatable servodrive? [00:56:08] <Ito-Brazil> You mean i need to built my own protocol and packages? [00:57:43] <Ito-Brazil> Is that opensource? [00:58:53] <Ito-Brazil> U.S 3rd world ? [01:06:34] <Ito-Brazil> mesa board... how much can it cost? [01:08:17] <Ito-Brazil> have ya some links about it? [01:09:31] <Ito-Brazil> my own digital output? [01:09:38] <Ito-Brazil> whoa, that´s my language!!!!! [01:13:15] <fenn> i'm supposed to be working ona cheap and libre servo controller using AVR microcontrollers..
[01:13:44] <skunkworks> Look at either the pluto board or the mesa 7I43.. Both are printer port interfaced and under $100. They do pwm and count encoders. [01:16:12] <eric_U> are there any good exports? [01:16:21] <fenn> what do you want to do with it? [01:16:56] <Ito-Brazil> oke dudes thanks for the answers! I got to go !!! [01:18:47] <eric_U> need a copy? [01:38:45] <skunkworks> fenn_: are you hosting your site - on site? [01:41:29] <eric_U> why you say dat? [02:40:19] <jmkasunich> what were you milling? [02:40:43] <jmkasunich> making anything fun? [02:41:13] <jmkasunich> have you taken a look at the fuel pump yet? 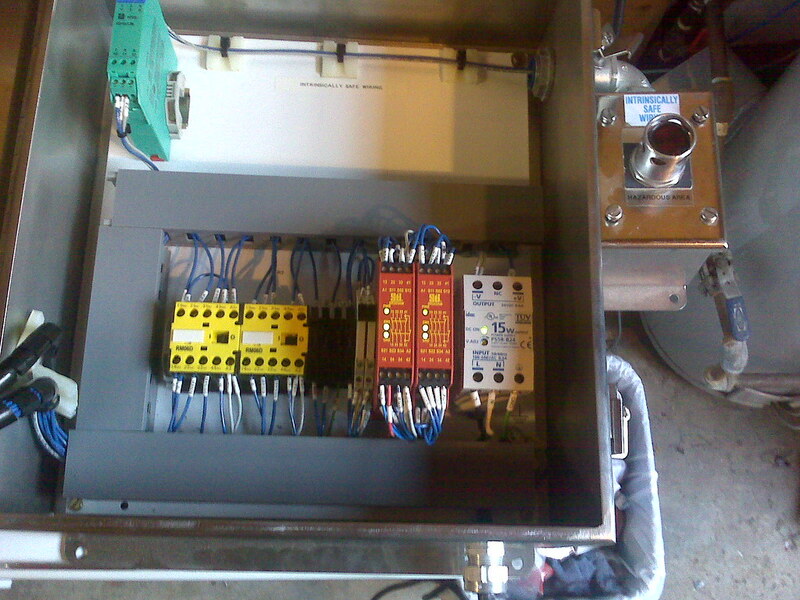 [02:43:08] <JymmmEMC> I'm stripping out that control box I got yesterday... It has (what looks like) heat shrink tubing that has markings on it. eg +24, -24, 234A, etc... Is there a machine that does that, or does it come in a spool and you cut off what you need? [02:44:36] <cradek> jmkasunich: did you end up single-pointing your internal threads? [02:45:16] <cradek> have you ever used radius comp in lathe mode yet? [02:45:58] <cradek> JymmmEMC: oh I have seen those. I don't know what makes them though! [02:47:10] <JymmmEMC> They look really nice... I always hate the number because they unroll, or get covered up. [02:50:00] <JymmmEMC> "shrink tubing printer"
[02:51:51] <JymmmEMC> I kinda like the idea of printing on shrink tubing though. [03:00:00] <JymmmEMC> forget that, I was looking at the wrong thing. [03:00:42] <JymmmEMC> Still, 110" and you would normally be using 1/2" or less, that 200 labels nicely printed. [03:09:17] <JymmmEMC> but I think a stand-alone might be better,; guess I could always carry a laptop. [03:51:31] <eric_U> job interview question: have you ever had an hour long discussion about wire markers? [03:52:41] <fenn> is that one word or two? [03:57:27] <eric_U> tomp, once I have that file pointer, do I have to use fprintf? [03:59:31] <eric_U> "I hate you guys" "you guys are a-------es" "especially kenny" "I hate him the worst"
[03:59:44] <tomp> kennys dead ! [04:09:44] <fenn> is schfifty greater or less than eleventy? [04:10:22] <eric_U> what you say? [04:11:48] <toastydeath> main screen turn on! [04:12:50] <fenn> is it about rabbits? [04:14:41] <eric_U> will they take avi files? [04:25:04] <fenn> that's real time? [04:41:10] <JymmmEMC> and will probably talk some more too... while it seems like a small thing, it can mean a lot of time saving too. 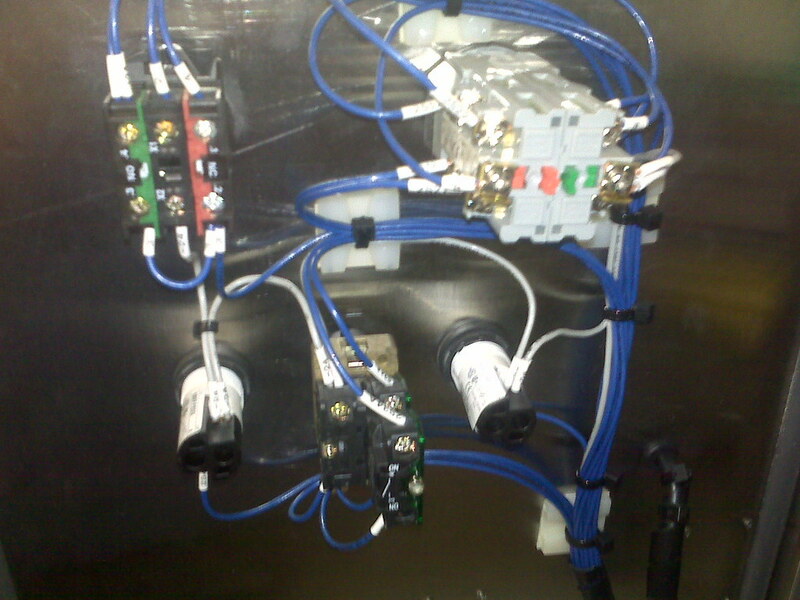 [04:43:49] <JymmmEMC> I once was wiring up a 5HP motor to 220 3ph, connected the #6 wire closed the panel, and hit the power switch. Totally blew out the motor and filled the shop with smoke. That "#6" was really "#8" where it had rubbed off the wire from the factory. So yes, an hour long dicussion on wire markers is a big deal. [04:45:17] <JymmmEMC> eric_U: My point was, what seems like such a little thing can really be very a significant decision. [05:13:55] <eric_U> why does gcc give a warning if there is no newline at end of file? [13:50:30] <micges> Is there any known problem that make xemc not starting ? [13:52:05] <jepler> look carefully at the output when you ./configure; it probably indicates that a necessary development header (for the Xaw library) is not installed on your system. [13:56:35] <jepler> it did, but that condition is not an error for all users -- in fact, relatively few users will ever choose to use xemc. [15:03:26] <JymmmEMC> On most wiring diagrams, the wires are usually numbered the same on both ends (eg #14), is that preferred over the destination? [15:05:42] <tomp> in hal we speak of the signal name (net) and the devices the net connects to, so i 'spose the wire number vs the dest is correct. [15:05:45] <JymmmEMC> BigJohnT: If you're wiring "on the fly" you prefer # or designation? [15:10:54] <JymmmEMC> Oh this is so cool (ok, I can be somewhat easily amused in certain cases) This safety relay has four 4C removable terminals, they placed lil red tags on the removable contacts as well as on the relay so you dont muck up the placement. [15:11:38] <JymmmEMC> Socket 1: ||..
[15:12:27] <JymmmEMC> Socket 4: |.|. [15:17:55] <tomp> books make it hard to say "fill pump overload" but easy for "127"
[15:18:25] <JymmmEMC> BigJohnT: I was just looking at those printers last night, which one do you have and how do you like it? [15:24:07] <JymmmEMC> BigJohnT: The ONLY thing I question is how much lead (empty tape) does it add to the beginning and end of each one... I hate having to always trim the extra off to fit in small areas. [15:38:11] <bill20r3> Anyone know if there is a common convention for stepper wire colors? I have a motor I cant find a datasheet for. 2 each of yellow/red/black/grey wires. [15:39:16] <JymmmEMC> BigJohnT: Cool, do you know which model kroy? [15:40:32] <JymmmEMC> BigJohnT: how permanent is the printing? [15:40:50] <JymmmEMC> can it eventually rub off to make a 8 look like a 6 ? [15:43:28] <bill20r3> john, I can figure out which wires are per-coill-pairs, but I dont know how to figure out the polarity of the coils. [15:46:57] <bill20r3> cool, maybe there's some tip in there that I haven't thought of. [15:47:01] <bill20r3> I'll give it another read. [15:49:31] <JymmmEMC> Just FYI... google "stepper wiring site:linuxcnc.org"
[15:49:52] <JymmmEMC> Just FYI... google "what you want to search for here site:linuxcnc.org"
[15:51:59] <bill20r3> I think I need to know the polarity, because I need to wire it unipolar. [15:53:35] <JymmmEMC> BigJohnT: Since the 3100 is cheaper, how do you guys link it? I notice it was serial only. [15:54:29] <bill20r3> yeah, I know. I'm showhorning the motor into an existing driver circuit. [15:57:14] <bill20r3> I'm was using a unipolar kp4m4 floppy motor, but it wasn't stout enough, which is why I'm switching to these larger unipolar motors. [16:04:09] <bill20r3> they're separate, it's like two 'motors' on one shaft, the wires exit the case in two different groups of 4 each (R/Y/B/Gr). [16:04:37] <BigJohnT> is it a double stack motor? [16:10:26] <bill20r3> * bill20r3 thinks. [16:10:57] <bill20r3> I have 14 of them, maybe I should just bust one open and take a look inside. [16:11:07] <bill20r3> google finds nothing, I've looked extensively. [16:12:16] <bill20r3> yeah, they make a variety of motors(and other stuff), just cant find any datasheets for these, or anything similar enough to be in the same product line. [16:14:46] <bill20r3> yeah, I suppose you're right. [16:15:11] <bill20r3> I hate trying to figure out the sequence, with the screwy polarity it'll be even worse. [16:15:21] <bill20r3> I guess I just need to sit down and take the time to do it. [16:17:55] <gene> anybody have a clue whats going on? [16:38:56] <birni> i've been successfully using emc2 for some time now to fabricate MCBs on Ubuntu 7.10. Some time ago, i got a dedicated computer for my machine and removed emc from the old one. [16:39:24] <birni> However, the parallel port on the old one doesn't work anymore. [16:39:53] <BigJohnT> for your printer? [16:40:25] <birni> I wanted to use it with avrdude to program microcontrollers, which worked before i installed emc, and it still works when i use a Ubuntu live cd. [16:42:52] <birni> looks like i have to set up the whole system again now. [16:45:05] <bill20r3> what os are is it that the port does not work with? [16:46:06] <bill20r3> does the port device exist (in /dev), and not work, or does it not exist at all? [16:47:24] <birni> it didn't exist in the first place, but "sudo mknod /dev/parport0 c 99 0 -m 660" fixed that. [16:48:02] <bill20r3> and what error does avrdude return? [16:49:26] <cradek> the emc2 package prevents the loading of the parport_pc kernel module by installing a file in /etc/udev. [16:50:34] <birni> "avrdude: can't claim device "/dev/parport0": No such device or address". From what i have seen from it's source code, it can't claim the device. [16:52:12] <bill20r3> are you trying this as root? [16:52:18] <bill20r3> or at least with sudo. [16:52:28] <cradek> do you want to use a parport-based cnc machine? [16:52:46] <bill20r3> let me loohmm. [16:53:20] <bill20r3> Does 'lsmod | egrep parport' show the module loaded ? [16:54:03] <birni> i used the parport with avrdude first, but it stopped working when i installed emc (which worked). lsmod prints "parport 37448 2 ppdev,lp"
[16:55:05] <cradek> so do you want emc to use the parport, or not? [16:55:32] <birni> not anymore. my machine is connected to another pc now. [16:55:47] <bill20r3> birni, sounds like the parport_pc module needs to be loaded. [16:55:54] <cradek> ok then you could use the simulator on this machine. [16:56:15] <bill20r3> heh, am I just confusing the issue? [16:56:17] <bill20r3> * bill20r3 stops. [17:18:06] <birni> cradek: i don't neet emc2 on this pc any longer, since i now have another machine for that. I found the file in /etc/udev you mentioned and removed it and the script it calls. [17:18:10] <birni> BigJohnT: thanks for that link, I did't read the "Uninstalling"-Section so far. I have now removed /etc/init.d/realtime. [17:31:34] <birni> well it did NOT work. i think i'll put an end to that now, i've messed this about for long enough anyways. thanks for the help and your patience, though. [22:34:41] <tomp2> is there any reason to think it IS difficult? [22:45:42] <granthes> I've noticed that there are several mentions of encoder drift errors when using the Motenc LIte card in the mailing list archives. Is this still an active issue or is there a fix for it? [22:49:24] <granthes> The encoders are 20000 pulse per inch. Is this likely a wiring issue or is it an issue with the Motenc board itself? [22:49:58] <tomp2> dunno, i'd get out a scope, and the spec on the encoder and the motenc-lite. i dont use motenc-lite myself. [22:50:25] <granthes> Ah. I see. [22:54:01] <granthes> Would a parport input be able to keep up with the pulse train from the encoders? My max rate is only about 5 to 6 ips. [22:54:56] <tomp2> yes, i dont knowthe specific rate but the parport is capable of much more than i expected... please ask this again as i am not sure. [22:56:09] <skunkworks> (that would be counting edges) 250cpr is 1000 edges. [22:56:49] <granthes> Cool. I'll have to get a isolation board for the parallel port to connect that way, won't I? The encoders are 5Vdc. [22:58:46] <granthes> True. I appreciate the info and I'll see what I can find. Thanks very much!